A poll of 873 adults by PoliticsHome finds strong support for more co-operation between the Conservatives and the Liberal Democrats. Conservative strategists are delighted at the politics of Wednesday's vote on Gurkhas. They believe it sent out two key messages: (1) Brown is isolated and (2) the Conservatives are the reasonable party, prepared to work with others. "A group of shadow ministers believe that one of Tony Blair's bigger strategic mistakes was to row back on co-operation with the Liberal Democrats when he won such a large Commons majority in 1997. These shadow ministers believe that - contrary to Labour's 'under-delivery' to the LibDems - the Conservatives should deliver more in practical co-operation in government than they promise in opposition." At his monthly press conference yesterday Mr Cameron admitted that he didn't know Nick Clegg well but restated his December 2005 identity as a "liberal conservative" and he said that the Conservatives will work with the Liberal Democrats on issues of common interest, such as the environment, strengthening local govenment and opposing the surveillance state. > On Seats and candidates today Leah Fraser explains how she is love-bombing Liberal Democrat voters in Wallasey. Those who worry about the volatility of Ipsos-MORI polls will have new ammunition. Last month Ipsos-MORI had the Tories 20% ahead but this month the lead is down to 10%. Nothing has happened in the last month to justify such a shift. By way of footnote: As we get closer to hung parliament territory - although I don't believe we will - the role of the Liberal Democrats potentially grows. The Indy's Steve Richards had a very interesting piece today saying that the LibDem rank-and-file would almost certainly veto any coalition with the Conservatives as part of a 'triple lock' that would have to approve any such arrangement. Senior Tories are debating the extent of outreach that should be made to the Liberal Democrats in the event of the Conservatives becoming the governing party at the next General Election. Tory strategists are hopeful that the next election will see the Liberal Democrat parliamentary party significantly reduced in size but they also believe that the Conservatives have a long-term interest in ensuring that Britain's third party looks as much to the Conservative Party as to the Labour Party as a future natural coalition partner. I understand that a group of shadow ministers believe that one of Tony Blair's bigger strategic mistakes was to row back on co-operation with the Liberal Democrats when he won such a large Commons majority in 1997. These shadow ministers believe that - contrary to Labour's 'under-delivery' to the LibDems - the Conservatives should deliver more in practical co-operation in government than they promise in opposition. The discussion is not of ministerial positions - although there might be some significant appointments to policy reviews - but of working groups on issues of shared interest. Action on civil liberties and on green issues are on the table. PS Congratulations to Nick Clegg this morning. His wife has given birth to the couple's third child, a son. 2pm: Peter Hoskin at Coffee House sees merit in the plan: "As for the Tories and their wider strategy, shacking up with the Lib Dems makes a whole load of sense. Not only would it isolate Labour, but it meets calls for bipartisanship-in-government to deal with the economic crisis." Tuesday, 7.30am: LibDemVoice responds to this post. Most reactions to Ken Clarke's return on last night's thread were positive. The same is true of reactions from bloggers and commentators. Arranged below are key arguments. His time as Chancellor remains respected (even to The Independent): "His tenure at the Treasury remains highly regarded – something that cannot be said of all former Chancellors." He did add, however, that whilst his was unlikely to be a formal coalition, he believed the Liberal Democrats would “be sensible and support a minority Conservative government”. It will put pressure on the Lib Dems to answer the same question themselves rather than brush it away with a "we want to maximise our votes and maximise our seats". But what of the main point? I agree entirely with Ed Vaizey. An exclusive PoliticsHome study of marginal seats,using an unprecedented sample of almost 35,000 people over 238 marginalconstituencies and based on fieldwork carried out by YouGov, gives us the bestever idea of what would happen if a general election were held now." "In consultations with senior members of the party, he said he was prepared to take the necessary steps that would enable the Tories to form a minority administration. Mr Clegg ruled out taking a Cabinet seat in a Conservative government in return for his support and instead would provide Mr Cameron with "supply and confidence" – meaning he would promise to back a Conservative Budget and would side with the Tories in any votes of confidence. As a result, Mr Cameron would be free to accept the post of Prime Minister from the Queen on the day after the next general election, even if he failed to win an outright majority." Read more in The Telegraph. CentreRight contributor Greg Hands MP has unearthed some very interesting records from his university days, The Telegraph's Three Line Whip column reveals today. Hands was Chairman of Cambridge University Conservative Association (CUCA) in 1988 and yesterday he stumbled across his copy of the 1986-87 membership list. The list includes one "N Clegg, Robinson College". who joined that year as a fresher. Hands in fact went to the same college, they are the only two MPs to have come from it. According to all the College records from this time there only ever was one N Clegg - the man listed as "Clegg, N.W.P. - Westminster School, London". Rather naively Clegg strongly denied this revelation - as he denied similar claims in the leadership contest - without asking for the evidence. This story may therefore become about his denial instead of his past membership of the Conservatives. 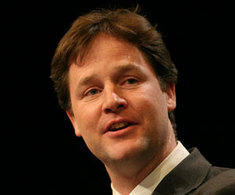 The Financial Times has an important interview with Liberal Democrat leader Nick Clegg. Mr Clegg sets out the kind of policy priorities that could persuade him and his party to support a Cameron-led minority government. He emphasises civil liberties, education reforms, the environment and more local decision-making. 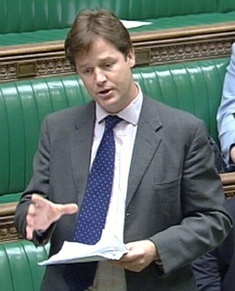 Mr Clegg's willingness to talk in these terms contrasts hugely with the stance of his predecessor. 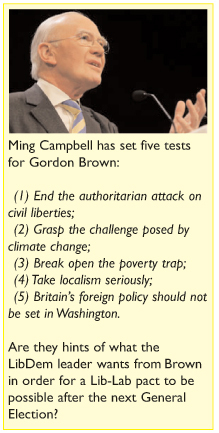 Ming Campbell only seemed interested in what would be necessary to deal with Labour (much to Paul Goodman's delight at the time). Related link: Only 9% of Tory members support a Conservative-LibDem coalition government in the event of a hung parliament. 79% of Tory members prefer a minority Tory government working with other parties on individual issues. More here. David Cameron and George Osborne jet off to China tomorrow to discuss economic and environmental issues. They will leave with the great encouragement of the latest YouGov poll and its 13% Tory lead. The detail of the poll shows that Brown's dissatisfaction ratings are now nearly as bad as Blair's. Mr Brown is seen as a little more trustworthy but not by much. Brown is not Mr Cameron's main worry, however. Team Cameron are confident that they can beat Brown. Their worry is the LibDems. ConservativeHome has called the LibDems the "bindweed" of British politics. Once LibDems invade political territory they tend to hold it. At the last two sets of local elections the Tories have been winning seats from the LibDems but will that start to change with Ming gone? Most Tory strategists do not expect the LibDems to be easy opponents with Nick Clegg at the helm (the likely winner when the LibDem ballot result is declared on Tuesday). With Charles Kennedy, Shirley Williams, Ming Campbell, Paddy Ashdown, Vince Cable, David Laws, Chris Huhne, Steve Webb and Julia Goldsworthy all possible members of a Clegg team, it will be a force to be reckoned with. They are all considerable figures able to command media attention. 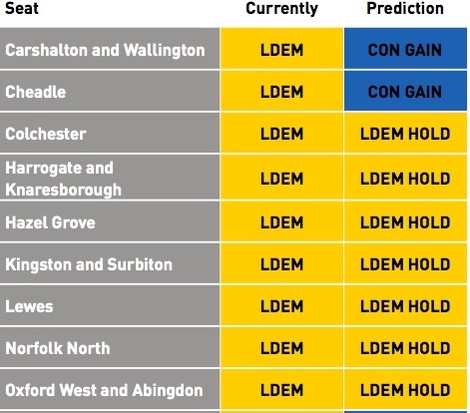 The LibDems hold so many seats in southern England that the Tories must win in order to command a working majority after the next General Election. 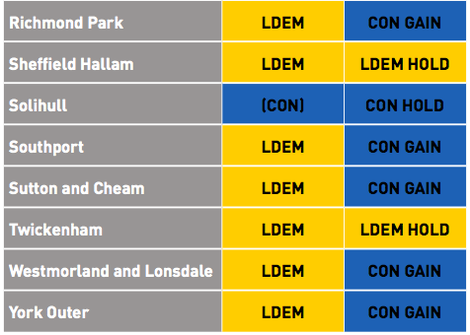 Some Tories close to Mr Cameron do not think that it is realistic to expect to win more than ten LibDem seats. In this scenario the Tories have to either make spectacular gains from Labour (no longer an unrealistic possibility) or think about making deals with the LibDems. An openness to working with the LibDems is the theme of an overnight article that David Cameron has written for conservatives.com. In it he notes how the Conservatives have worked together in recent times on forcing Labour to adopt a Climate Change Bill and on the passage of the Sustainable Communities Bill. He hopes that the LibDems and the Greens can work together in 2008 to "decentralise political power". Vince Cable has already dismissed the invitation. David Cameron must be living in "cloud cuckoo land," the outgoing LibDem leader said. "The Liberal Democrats will continue to work with other parties on issues where we have common ground and can work together in the national interest," he said. Mr Cameron probably expected the reaction. If he ends up looking the reasonable person - wanting to co-operate - that's not too bad. More significantly he is putting markers down so that come the next election the party can show that it has a track record of looking co-operative. Remember the Greg Dyke offer to Ming Campbell? Most Conservatives do not want Lib-Con deals and opposition to such co-operation will be a hallmark of ConservativeHome's 2008 manifesto, launching on 7th January. "Nearly half of members polled (49%) prefer Gordon Brown as Prime Minister than David Cameron (18%) and would prefer to side with Labour rather than the Conservatives in the event of a ‘hung parliament’. 44% would oppose a coalition with the Tories under any circumstances, while only 26% would oppose a similar deal with Labour." Even with Labour exposed as incompetent, sleazy and disunited, more than twice as many LibDems prefer Brown to Cameron. Staggering. We need to beat this party. The thought of sharing power with them - and the enormous compromises that that would require - appals me. "David Cameron's recent speech on immigration was incredibly impressive - sensible, rational and positive. It persuaded me that he is a leader who has changed his party and will change this country. I'm afraid that the Liberal Democrats have lost their way and are no longer a serious force in politics. I'm here to serve the people of the North West and I think I can only do that now as a Conservative. I'm sure I will not be the last politician to reach the same conclusion." Karim is now officially under the Conservative whip. He had recently been reselected as the second-placed Lib Dem candidate (behind the active Chris Davies) by North West Lib Dems, but as the North West region is losing an MEP his re-election was in doubt. David Sumberg, one of the three Conservative MEPs for the North West, is standing down at the next election but the rules state that his "top slot" on the list has to be taken by a female candidate. The Conservative MEPs are electing the next leader of their delegation on Wednesday. It is not clear whether incumbent leader Timothy Kirkhope, who was involved in negotiating Karim's defection, will be able to win. Nick Clegg and Chris Huhne were interviewed by Andrew Marr this morning and they both ruled out a referendum on the EU Treaty. It appears that it's not only Gordon Brown who can't keep a promise. The unwillingness to trust the people on this important constitutional change underlines one of the big gaps between the Conservative and Liberal Democrat parties. Both of these former MEPs are fully signed up to the further loss of British powers to the European Union (see this essay from Lee Rotherham). William Norton wrote about the party's belief in proportional misrepresentation. Nick Clegg used his Marr interview to reject the popular, and not unfounded idea, that he's on the right of the Liberal Democrats. He attacked Thatcherism as "soulless". He was "appalled" by it, he said, and the former Prime Minister's famous (and grossly misrepresented) 'There is no such thing as society' ethos. He represented Sheffield, he continued, and will never forget the "ravages" imposed on the city by Thatcherism. "Now it's quite possible that we never hear of this policy again and that it changes nothing. The Tories may run scared of it (though I doubt Labour would). But it is also very possible that this policy becomes a massive problem for the Lib Dems during an early election campaign. It's one of the very few proposals they could have come up with that has the potential to cut-through. And if it does it would be a disaster for them in quite a number of seats." PS William Hague was also on Andrew Marr. He said that the party still hadn't decided what it would do if the EU Treaty does become law. All Tory efforts were focused on defeating the Treaty and he highlighted the possibility that the Lords might yet frustrate Gordon Brown's ambitions to pass the slightly-altered Constitution. The Shadow Foreign Secretary reiterated his pledge to change the law so that any further transfers of powers to the EU would automatically require a referendum. The pollsters on polling 5: Are Liberal Democrat voters a largely Conservative or Labour-leaning group? Are Liberal Democrat voters a largely Conservative or Labour-leaning group? In summary: Andrew Hawkins says Lib Dem voters are more attached to Labour as a brand but because of the Iraq War they are lending their votes to the Conservatives. Stephan Shakespeare says they are not one block, some lean to the left some to the right, some people vote Lib Dem because they know they are not going to win. Ben Page says they are more Labour leaning than Conservative, partly because they have picked up a lot of disaffected Labour voters. You can also read Peter Riddell's answers to the same five questions. Will the Tories govern alone again? There is a thoughtful article in tomorrow's Sunday Times from Michael Portillo. While acknowledging that Cameron's handling of the Dyke affair was clumsy he explores the big reason why it happened - the Tories' belief that they need to form these sorts of surprising alliances if they are to prosper in Britain's new electoral landscape of coalition governments, growing use of proportional representation and the rise of the smaller parties. ConservativeHome's own belief is that the party would be better attempting to defeat the Liberal Democrats (as the Scottish party are attempting to do) rather than prepare the ground for coalition but the party leadership revealed their instincts this week with the Dyke debacle. It’s alarming that, of the three main political parties, the Liberal Democrats have the worst record in local elections of fielding candidates against the BNP. It is time that they woke up to the danger posed by this extremist party. The Liberal Democrats have a poor record with regards to challenging BNP candidates. 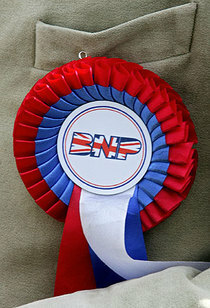 Conservatives are contesting 96.7 per cent of town hall seats against the BNP, with the Liberal Democrats giving the BNP a free run in 129 wards (18 per cent). Councillor Steve Jones who has already resigned as group leader of the Liberal Democrats in Darlington said that ‘he has no sympathies for the policies of the BNP’. His party has issued a statement describing his actions as ‘an error of judgment’. "Dave’s been ducking and weaving. He wants to keep his past private. Well, I can understand that. If I had his past I’d want to keep it private too. Come on Dave - it's time to come clean. Admit your guilty secret. In your youth, you were a Tory Boy and your heroes were Michael Howard, Norman Lamont and John Selwyn Gummer. You know, with pin ups like that, frankly, I'd want to keep my past private too. But seriously, it's not your youthful indiscretions that worry me - it's your adult misjudgements. Teenage kicks are one thing, but you’ve got to grow up some time. It’s time you admitted your mistakes. Particularly your support for the Iraq war." Ming makes his intervention after a narrow conference victory on Trident. By 454 to 414 he defeated a call for Trident to be scrapped. The strength of the anti-Trident vote is a reminder of the gulf between Tory and LibDem activists. An ICM survey for Friday night's Newsnight found that Ming Campbell has made little positive impact on voters over the last year: just 6% thought he would make the best Prime Minister. 28% chose Gordon Brown and 29% opted for David Cameron. 49% to 22% believe that Charles Kennedy would make a better LibDem leader than Ming Campbell. Last year's green tax switch at last year's unified Party Conference - a policy switch that has been partly copied by the Tories - "Senior Lib Dems claim to be delighted that Mr Cameron has worked so hard to put climate change on the agenda. They point to polling data that suggests voters still think the Lib Dems are easily the greenest of the mainstream parties. The more salient environmental issues become, they argue, the better the Lib Dems should do." "Given Mr Cameron's grab for traditional Lib Dem voters on the environment, civil liberties and localism, the party's poll rating, hovering around 20%, has been impressive." The growing possibility of a hung parliament where the LibDems would hold the balance of power. In an interview for The Times, LibDem leader Sir Menzies Campbell has revealed that his chief whip, Paul Burstow, has been given the task of reporting on how coalition talks should be conducted. In addition he told The Times that the price of doing a deal with Gordon Brown would be a firm commitment to proportional representation for Westminster. A poll of Tory activists by this website recently revealed that a promise to hold a referendum on PR for Westminster would be “unacceptable” to 67%. "Now that he has discussed the subject once, the media can be forgiven if the question is repeated again and again. It's a legitimate subject for debate. The polls currently point to a Conservative victory, but I think a hung Parliament is by no means beyond the realm of possibility. By even mentioning the possibility of a formal coalition, Sir Ming has opened a Pandora's Box." I'm still trying to understand the tactics of key Cameroons when it comes to the LibDems. I'm not sure if they're positioning for a formal coalition with Ming's party in the likely event of a hung parliament or if they are more ambitiously trying to split Britain's third party by detaching Orange Book reformers like David Laws and Nick Clegg from the more big state LibDems like Phil Willis and Simon Hughes. "Their most talented MPs - David Laws, Nick Clegg, Vincent Cable, Jeremy Browne, and others - must now think seriously about which direction the party should go in. It is time they sat down and looked at the refreshed Conservatives, and decided whether, in the run up to the next election, they position themselves as the guarantors of a discredited Labour government, or part of a coalition to renew British politics." It wasn't long before Ed Vaizey appeared to recant. "I notice that the hon. Member for Carshalton and Wallington [LibDem MP Tom Brake] flinched slightly when I suggested that Liberal-Conservative co-operation was the future. I acknowledge that such a view is not shared by all Liberal Democrats, but I am informed that more cerebral Liberal Democrats see it as the path to the future." "Yet while natural conservatives will want to celebrate the happy completion of the first year of Ming rule, the same, sadly, cannot be said of the nation’s dwindling number of Liberal Democrats. For the country’s third party, the last 12 months have been arid times. Dropping in the opinion polls, neglected by the news media, increasingly marginal to the nation’s debates, the Lib Dems have become like Chelsea Pensioners — magnificent in their way but redolent of another age. It is striking that the eclipse of the Liberal Democrats should coincide with Ming’s accession to the leadership. He is, in a way, the purest living embodiment in British politics of the Peter Principle — the law which dictates that people will rise just one level above their natural slot in life, to a position in which their weaknesses are then cruelly exposed." Ouch! The article goes on to say that the LibDems have stopped thinking: "Take a gander at the Lib Dem party website and you’ll find that all its spokesmen’s statements are reactions to what the other parties are doing — with scarcely a fresh idea from one month to the next." All quite true but not helpful (I wouldn't have thought) to encouraging LibCon co-operation. There have been a series of recent articles on YourPlatform exploring policy agreements and differences with the Liberal Democrats: Martin Sewell on drugs; David Dundas on nuclear power; Lee Rotherham on Europe; Bob Seely and Bill Melotti on civil liberties; Robert Colville on localism; and William Norton on PR. ConservativeHome believes that Team Cameron does not believe that a traditional Conservative agenda can secure another parliamentary majority for the Tory Party. For this reason it has a below-the-radar plan to build a Conservative Party that increasingly resembles the Liberal Democrats or/and can possibly form an alliance with the Liberal Democrats (and possibly some Blairites). That is why we surveyed Tory members about their views of ever closer LibCon co-operation. The results of that survey were published earlier this week. Target one - LibDem MP David Laws: Oborne reveals that key Orange Booker David Laws was offered a shadow cabinet position if he defected to the Conservatives. The offer was made by Shadow Chancellor George Osborne with the full authority of David Cameron. Laws refused on the grounds that he was not a Tory. Target two - David Owen: Peter Oborne reports that former SDP leader David Owen is also being "assiduously wooed." Earlier this week in an interview for ePolitix.com, Lord Owen spoke warmly about the possibility of LibCon co-operation: "If Cameron has the largest number of MPs but not an outright majority, I hope he can deal with the Liberal Democrats and come to an arrangement... I think there is common ground being established and I think people can see that a lot of Conservative policies are acceptable now." Target three - Lord Adonis: One of the most important first decisions of David Cameron was to support Tony Blair's education reforms. The reforms, designed by former Downing Street thinker Lord Adonis, only secured parliament passage because of Tory support. Peter Oborne speculates that Andrew Adonis may feel that his schools legacy will be more secure with a Cameron-led than a union-dependent, Brown-led government. Target four - Peter Mandelson: The most controversial Tory target is apparently Peter Mandelson, the dark prince of the New Labour project. David Cameron has met the EU Trade Commissioner twice (Guido thinks three times). Oborne writes: "Relations are more than professionally cordial: they are warm and friendly. I have heard reliable accounts of Mandelson's table talk from Brussels on the subject of the Tory leader. Although distressed by Cameron's obstinate Euroscepticism, the Commissioner is otherwise emphatic in his approval, comparing him to the young Tony Blair of 11 or 12 years ago when Labour was in opposition." Peter Oborne's article contains the extraordinary titbit that Gordon Brown has not spoken a single word to Peter Mandelson since became EU Commissioner. If true that is a damning indictment of Gordon Brown. How can Britain's Chancellor of the Exchequer refuse to have dealings with the EU's Trade supremo? Peter Oborne's conclusion is on-the-money: "Brown's refusal to have dealings with Mandelson can only be seen as a sign that he is ready to put his private vendetta (which dates back more than a decade) before the national interest." It may be one of the big gains for Team Cameron in future months if the Blairites start causing Brown trouble once he is installed as Labour leader. If Gordon Brown doesn't start to bury grievances he'll only have himself to blame for what follows. Some LibDem demands for a coalition...? “The British people have spoken. It is now the duty of all politicians to pay heed. “It is clear the public has little confidence in this Labour Government and its broken promises. But nor do they trust the empty promises of the Conservative Party. “Our role as Liberal Democrats is simple and straightforward: to be honest brokers on behalf of the British people, and to do what is right for this nation. “Here’s how we’ll do it. Liberal Democrats do not believe in ‘behind-closed-doors’ decision-making: what we say in public is what we’ll stick to in private..."
The day after the next General Election? To coincide with a poll of Tory members showing widespead opposition to a Tory-LibDem pact... the 18DoughtyStreet.com team has produced a tongue-in-cheek video report of the day after the 2009 General Election. Watch it here. (1) Labour’s deep troubles have not yet produced an election-winning lead for the Tories with the LibDems’ support stubbornly persistent at about 20% and ‘other parties’ growing. The average 5.25% Tory lead comes before any ‘Brown honeymoon effect’ and the possibility that it might improve Labour’s position. (2) A 6% Tory lead - projected by Mike Smithson of PoliticalBetting yesterday - would – according to UK Polling Report’s Swing Calculator – produce this parliamentary share of seats: LAB 284: CON 283: LD 54: OTH 29. Such a Labour advantage would reflect the uneven distribution of population across Britain's parliamentary constituencies - with boundaries failing to reflect the movement of population from (crudely) urban seats in the north to more suburban seats in the south. (3) A LibCon pact is one of the most under-discussed possibilities at the next General Election even though 52% of Tory members have told ConservativeHome that a coalition or minority government is the most likely result. (4) Key ‘Cameroons’ Michael Gove and Ed Vaizey have both made very warm noises about the possibilities of ever greater LibCon co-operation. William Hague, Francis Maude and Ken Clarke have all made similarly positive noises. (5) More important than what is being said are perhaps the policy changes made by David Cameron that all position the Tories much closer to the LibDems: Kyoto environmentalism; less enthusiasm for nuclear power; a more doveish approach to Iraq; a greater emphasis on civil liberties; and a large acceptance of Labour’s legacy on tax and public spending. (6) During 2005 ConservativeHome successfully opposed Michael Howard’s attempt to change the rules of the Tory leadership contest. During 2006 ConservativeHome championed Tory members’ scepticism about the now heavily-diluted A-list. During 2007 ConservativeHome will put similar energy into being a platform for members’ scepticism about LibCon co-operation. ConservativeHome aims to put together a mailing list of activists who wish to oppose a formal coalition and that group will plan action together. (7) That scepticism is revealed in ConservativeHome’s January poll of Conservative Party members. The same survey that came within 1% of predicting the outcome of the Cameron-Davis contest finds little enthusiasm for a formal LibCon coalition with the likes of Menzies Campbell joining David Cameron around a Cabinet table. (8) Should no party win an outright majority, 79% of Tory members prefer a minority Tory government working with other parties on individual issues. Only 9% want a formal coalition with the LibDems. Full data can be found in this pdf . (9) Opposition to nuclear power stations, support for proportional representation and enthusiasm for the EU are key hallmarks of the LibDems’ agenda but deals on any of those issues would be “unacceptable” to large majorities of Tory members. Even a promise to hold a referendum on PR for Westminster would be “unacceptable” to 67% of Conservative members. A larger number – 70% - oppose any deal which would stop the building of new nuclear power stations. 60% would regard it “unacceptable” if a coalition scuppered David Cameron’s pledge to take Britain out of the EU’s Social Chapter. (10) The message from Tory members is that any co-operation with the LibDems would have to be rooted on an ad hoc basis in, perhaps, a rebalancing of the tax system towards environmental considerations, protection of civil liberties and greater decentralisation. Related link: May 2006 poll on Tory members' attitude to co-operation with the LibDems. The January edition of ConservativeHome's monthly survey of readers' opinions is now online. Please click here to have your say. This month's ConservativeHome poll gives rank-and-file Tory members an opportunity to say what they think about the possible path to greater Lib-Con co-operation. Ming Campbell speaks to his conference today and is reportedly going to describe his "amazing" life story and his rise from a Glasgow tenement flat to leadership of the LibDems. The LibDems are becoming more and more important in British politics because of the real possibility of a hung parliament after the next election. David Cameron has certainly been able to open up a lead over Labour but not yet a majority-winning lead. Some Team Cameron strategists are single-minded in their determination to address the LibDem issue. They know that a Tory majority is difficult to achieve unless LibDem MPs in leafy southern seats are turfed out. Project Cameron's emphasis on the environment and civil liberties and the reluctance to talk about tax, immigration and Europe could have been designed to (1) increase the possibility of a LibCon coalition after the next election and (2) to woo previous Tory voters who left the party because it was perceived as too right-wing. "Mr Cameron need not bother making cups of tea for Sir Ming, if that is his objective. [A Con/Lib pact] will not happen. Anyone who listened to the Liberal Democrats' debate on tax policies on Tuesday would recognise this is a left-of-centre party, gripped by the need to redistribute widely, and to raise cash for some expensive spending commitments, such as the abolition of top-up fees for students. Those speaking in favour of the new economic package argued passionately that the proposals redistributed more extensively than the party's previous policies. Opponents of the proposals protested that there was a need to redistribute more widely still, and to raise additional money for the party's spending commitments." If tax and Europe are big enough barriers to a Libservative pact the other big boulder is PR. Simon Hughes has said that electoral reform is the bottom line for any deal. Steve Richards does not believe that a LibLab pact is particularly likely either. Labour would have lost their majority if a hung parliament arose and English voters would resent a Scottish Liberal Democrat propping up a rejected Scottish Labour Prime Minister (assuming Brown succeeds Tony Blair). Mr Richards does not believe that a hung parliament is likely. Given the number of LibDem MPs and the way they bed themselves into seats, I'm not so sure. Where I do agree with him is the unlikelihood of all but a few Orange Book LibDems propping up a Cameron-led minority administration. I still think our best strategy for Government is fierce campaigning against the LibDems and the simple message... Vote Tory to Get Rid Of Labour.